The collection is of an importance and breadth that is unparalleled in modern times, with some 300 pieces ranging chronologically from the 15th to the 19th centuries and geographically from India to Europe and South America. It is especially rich in works by the great English silversmiths of the Georgian period, notably Paul de Lamerie, and there is a strong emphasis on German pieces among the Continental silver. Spectacular silver and gold treasures made for kings, princes and noblemen are on display in one of Britain's great architectural masterpieces. Among the great rarities of the Gilbert Collection are a silver-gilt and maple wood mazer, or drinking cup, dating from around 1480 and a silver and parcel-gilt beaker made in London, 1525-26. Fewer than 400 pieces of English medieval silver are believed to have survived, two thirds of which are ecclesiastical plate and one third domestic items such as these. Tudor domestic vessels are also rare survivors and the Gilbert Collection represents most of the characteristic forms of the period. Among them is a pair of silver-gilt tankards, embossed and chased with strapwork, fruit and foliage, typical of late Elizabethan silver. Made in London in 1602-3, it is one of only two matching pairs of tankards known from before the reign of James I (1603-25). A pair of silver-gilt flagons or livery pots, London 1610-11, probably owe their survival to the fact that from 1631 they belonged to St. Augustine's, Watling Street. When the church was destroyed during the Second World War they were transferred to St. Mary-le-Bow, Cheapside. The value attached to salt in early times resulted in elaborate receptacles that became symbols of social importance. Among the imposing salts in the collection is a cylindrical silver-gilt example, London, 1581-2, standing nearly 11 inches high. It is richly embossed and chased with lion masks, strapwork and sprays of fruit and the finial is surmounted by a warrior with a shield and spear. The so-called bell salt is a rare form and a silver and parcel-gilt example was made in London, 1599-1600. The collection is especially strong in baroque silver by outstanding silversmiths such as Philip Rollos, Anthony Nelme and Benjamin Pyne from the 17th and early 18th centuries. Among the latter's works is a pair of silver-gilt hexagonal dishes, London 1698-99, bearing the arms of Courtenay of Powderham Castle, Devon. The chasing round the border is marked by Continental influences and has been described as "one of the most remarkable examples of flat-chased work on English silver". Originally from a set of four, the other pair is in the Victoria and Albert Museum, London. The most successful of the Huguenot goldsmiths was undoubtedly Paul de Lamerie, who arrived in England with his parents around 1689, and the Gilbert Collection includes one of the greatest groups of de Lamerie's works in this country. One of the most important works of his early career is a pair of silver-gilt sconces, circa 1717, which mark the high point of his interpretation of the Régence style. They are on an unparalleled scale, nearly 22 inches high, and were probably designed by Daniel Marot, another Huguenot refugee who was William III's architect. Engraved with the Foley arms, they remained in that family until 1925 when they were acquired by Lady Trent who lived in Jersey. When the Germans occupied the island in 1940, Lady Trent's chef hid the sconces and other fine silver in a well in the greenhouses and retrieved them safely when the war was over. One of de Lamerie's most important patrons was the Prime Minister Sir Robert Walpole. Two pieces bearing his arms are in the collection: a two-handled oval silver basket, 1731-32, which was later inherited by Walpole's great grandson, Horace Walpole of Strawberry Hill; and a pair of candelabra, 1731-32, which is an early example of de Lamerie's rococo style and his earliest recorded candelabra. 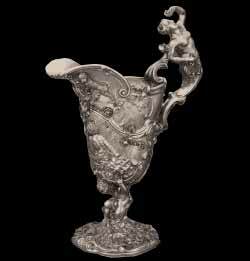 Among the most flamboyant and imaginative rococo pieces by de Lamerie are a silver ewer and dish, 1742-43, bearing the arms of another of his most important clients, the sixth Earl of Mountrath. The helmet-shaped ewer stands on a foot chased with flowers, waves and a lizard, the stem is moulded as a kneeling putto and the body is chased with a figure of Neptune in a seascape with scrolls, clouds and personifications of the winds. The handle is a female demifigure rising from flowers and holding a shell. The large dish is similarly elaborate, the border chased in high relief incorporating figures of Juipiter, Diana and putti with elaborate scrolls, masks, shells and flowers. Made when de Lamerie's powers of inventiveness were at their zenith, the only comparable set belongs to the Goldsmiths' Company. While silver of the first half of the 18th century was dominated by Paul de Lamerie, Paul Storr was the great maker of the early 19th century, and works by this master are another of the collection's strengths. Among them is an elegant silver-gilt basket in the form of plaited ears of wheat, 1797-98, the underside engraved with the crest of William Beckford of Fonthill who has been described as a "prince of collectors ... and one of the most colourful individuals in the history of English art collecting". The basket is one of several pieces of Beckfordiana in the Gilbert Collection. A particular feature of the collection is a group of silver which belonged to various sons of George III including four Paul Storr soup tureens and stands bearing the royal ducal crest, coronet and Garter badge of Ernest Augustus, Duke of Cumberland who was later King of Hanover. The tureens are magnificent English examples of the neo-Egyptian style and among the grandest of all designs made to the order of Rundell, Bridge and Rundell, royal warrant holders from 1806, and employers of the leading artists and craftsmen of the day. Much of the European silver in the collection comprises grand pieces made as works of art for princely treasuries of the 16th and 17th centuries. These valuable objects of dramatically imaginative designs often incorporate exotic or precious natural or man-made materials. Rock crystal was one of the most precious of these materials and a 16th-century German tankard was carved from a single block of crystal with elaborate silver-gilt mounts which include lion feet and a handle formed as a female demifigure rising from foliage, a female mask, wings and fishtails. This remarkable piece represents the ultimate of German Renaissance goldsmiths' work and epitomises the mid-16th century Schatzkammer, or treasury, object. During the Middle Ages rock crystal, coconut and rhinoceros horn were among the exotic materials thought to possess miraculous powers and were therefore highly prized. A German silver-gilt-mounted coconut shell, circa 1580, is carved with scenes of the Passion of Christ, the silver-gilt finial in the form of the Virgin Mary, while a rhinoceros horn beaker, probably from Flanders, circa 1590, has a silver-gilt base, rim and cover, surmounted by a finial in the form of a rhinoceros. The first live rhinoceros seen in Europe since antiquity arrived in Lisbon in 1515 as a diplomatic gift to the King of Portugal. Rare shells were also used by 16th-century goldsmiths to create exotic vessels in the mannerist style. Among those in the collection is a German silver-gilt and polished turban shell, circa 1590-1600, surmounted by an eagle's head and wings chased with plumage. A particularly brilliant and extravagant jewelled object is a silver, parcel-gilt and mother-of-pearl cup in the form of a partridge studded with rubies and emeralds. Made in Germany, circa 1600, it was formerly in the collection of Baron Leopold de Rothschild in London. Among the later Continental pieces is the impressive Lafayette Vase made in Paris, 1830-35, by Jacques Henri Fauconnier for presentation to the French hero of the American War of Independence, the Marquis de Lafayette, although not completed until after his death in 1834. The richly decorated silver-gilt and ormolu two-handled vase stands on a plinth with scenes in relief from the life of Lafayette with four free-standing allegorical figures at the angles. Among the most spectacular exhibits are two pairs of Russian silver, parcel-gilt gates made in Kiev, circa 1784, and presented by Empress Catherine the Great to the churches at Pechersk Lavra (monastery of the caves), Kiev. These magnificent gates, standing over 7½ feet high, are unique outside the former Soviet Union and were sold in the 1930s by the Soviet government when they were acquired by William Randolph Hearst. Known as royal gates because Christ as the King of Glory passes through them in the form of the Eucharist, they were the central feature of the iconostasis that separates the sanctuary from the nave in Orthodox churches. Perhaps the most exotic silver in the collection are the 19th-century Indian pieces which include a pair of wooden doors covered in silver panels and originally intended for a Rajput palace. These ornate silver doors are embossed with splendid examples of the imagery of the hunt and romance associated with the princely culture of Rajasthan. There are also two highly-decorative silver howdahs and a silver and parcel-gilt throne, the arms in the form of standing lions, and a footstool. Thirty gold objects comprise the largest collection of solid gold wares in the country. Among them is one of the earliest-known gold vessels, made in the cradle of metalworking techniques, Anatolia (modern Turkey) in the Bronze Age, circa 2500-2000 BC. The remarkably sophisticated and elegant ewer is made from a sheet of gold embossed with grid patterns separated by ribs. A survival almost as remarkable as the Anatolian ewer comes from the other side of the world. A 17th-century two-handled embossed gold cup made in South America, probably Peru, was recovered in 1985 from a wreck that is believed to part of the Spanish bullion fleet sunk in 1715 off the Florida coast. A gold cup possibly made in Augsburg, South Germany, dated 1665, is decorated in enamel with grotesque masks, sprays of flowers, exotic birds and the coat of arms of Count Georg Nikolaus zu Rosenberg who presented the cup in 1665 to the Holy Roman Emperor Leopold I whose portrait is also incorporated in the decoration. This opulent presentation in commemoration of the signing of a peace treaty with the Turks clearly reflects the gratitude of a major landowner whose property had been threatened by the extent of the Turkish inroads to this part of Europe. A 19th-century piece is a gold and enamel chalice enriched with pearls and diamonds. It is unmarked but was probably made in Paris, possibly by Lucien Falize, and has been described as "one of the most sumptuous creations of the 19th-century Historicist Style". Such pieces were produced for display at international exhibitions and made purely for prestige. This chalice is typical of the period's eclectic approach to design, combining elements of mid-15th to early-17th century ecclesiastical and secular ornament. The perseverance and passionate dedication of the Gilberts to acquiring works of the highest quality has resulted in a collection of silver and gold that provides under one roof a encyclopaedic display of the art of the goldsmith.